Get ready for Halloween in your classroom or at home! 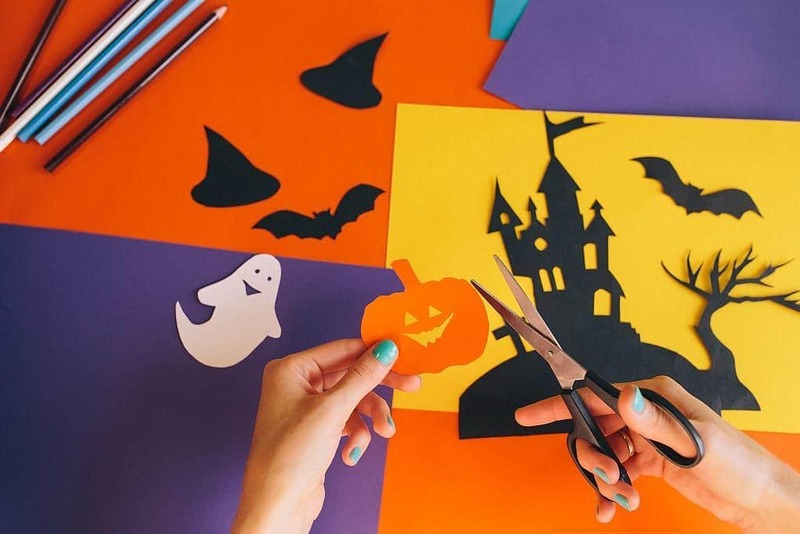 Choose from over 200 easy and fun preschool Halloween art ideas. , googly eyes, cut yarn, confetti, parchment paper, magnets. Let the children squeeze out a good sized blob of the craft glue on a piece of parchment paper. Let them decorate their glue blob with googly eyes, cut yarn, confetti, etc. Let their “monsters” dry completely. Glue a magnet on the back of each monster. Materials needed: paper plates, paint, glue and pre-cut shapes for facial features. Let children paint plates with black or gray paint. Then, when it’s dry, they can glue on eyes, ears, a nose, a mouth, and whiskers. They can be used as a mask or cute decoration. Take a paper plate and with a hole punch, punch several holes around the outside. Then fold the plate in half and punch a hole in the middle (this actually make two holes). Take a long piece of black yarn and have children lace it through all the holes. I start the yarn out in the middle and tape the end to keep it secure while they lace it through the hole. When they’ve run out of yarn, tape the end to the plate, and have them place a spider sticker in the middle of the web. Trace the child’s foot on white construction paper, then add googly eyes and a mouth. This is a quick and easy idea, and the children thought it was very cute. On a piece of wax paper, have the children squirt out glue in the shape of a ghost and add googly eyes, glitter, etc. Then, open a paper clip in the shape of a ‘V’ and insert it into the top. Let it dry. Once dry, carefully peel off and place in string in the paper clip to make a ghost necklace! This makes a wonderful lesson and the kids love it! This great sensory activity starts with orange Playdoh and it is so simple. The class can make it from scratch, or the teacher can buy orange Playdoh )depending on age group and time.) Next, have children mix pumpkin pie spice with Playdoh to create “Pumpkin Playdoh.” I also bought cool Halloween cookie cutters so that the children can use them with their new Playdoh. Watch out for little ones who might want a taste! Give each child white crayon. Have them draw a spooky picture on a white piece of paper (ghosts work well.) They will need to press a little harder than usual. Once they have completed their drawing, have them use watercolors to paint over the entire paper. The drawing will ‘magically’ appear because the watercolors will not stick to the crayon. Materials needed: brown paper lunch bags, orange and green paint, green construction paper, green pipe cleaners, black marker, glue. Take the bags and paint the bottoms orange and the tops green. Let them dry. Draw a face each one with a marker. Take the green paper and cut out leaf shapes, then fill the bag with party treats. Twist the top and secure it with green pipe cleaners (this makes it look like pumpkin vines.) Take paper leaves and glue a few to the vine. You now have a fun, cute and cheap party favor!